It’s been a while since Cherry Cordial and I have worked a project together! 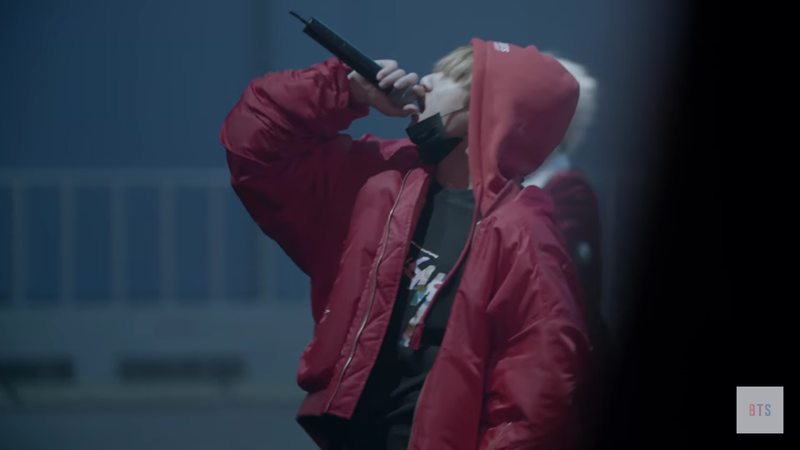 What better time to break that terrible streak, than with the new YouTube Red series, BTS Burn the Stage! (Which we are both very excited for.) We talked about possibly doing this as some sort of podcast extension, but instead, decided to old school it and do a chat! (Do you remember, way back when, when Cherry, Kfangirl and I used to do the Barefoot Friends posts for DramaFever?) So. I guess we’ll just jump into it! Stephanie: What up Cherry Cordial, long time no chat! Cherry: Hello there, Stephanie! Barefoot Friends seems sooooo long ago. Stephanie: That’s because it was, a MILLION years ago. And by years ago, I mean Kdrama years, which are very short years indeed. Pre-marathon chats on the phone, pre-meeting in person, pre-podcast even! Good lord. That was long ago. Cherry: So! BTS! Of course, it’d be BTS to bring us back to the classics. Stephanie: Our joint love of BTS, which makes us dig out those computers, power through those screenshots, and watching our favorite boys….not that the last one was hard at all. I think I managed to keep the squeeing down to a minimum. Cherry? How’d I do? How are your ears today? Stephanie: It didn’t quite get Lovesick bad, but when I saw them in their shades of purple and violet hair sitting in a semi-circle, RM being all leadery at the beginning? Yeah. That might have done a little something-something to me. 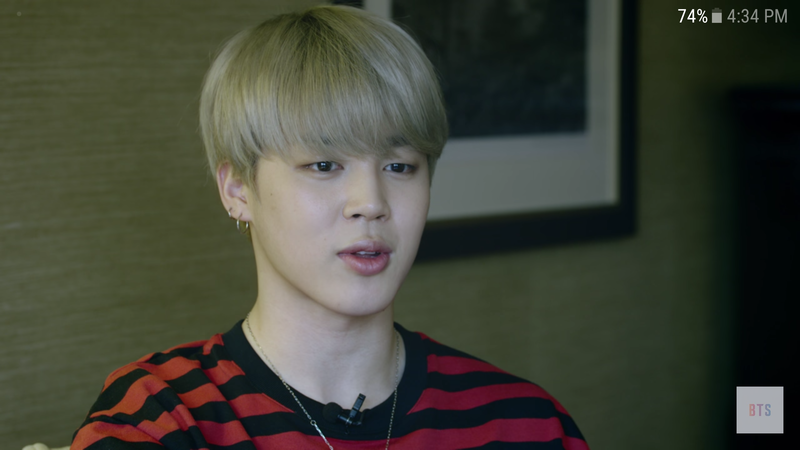 Cherry: That scene was interesting to me, since it was mostly RM and Yoongi talking. Made me wonder if the others were too shy to speak up. Stephanie: I remember you saying that! It makes sense to me that RM (look how I’ve caved and slipped into calling him RM) would do a great deal of the talking. Yoongi surprised me as he seems (at least the Yoongi I’ve built up in my head) the type to do what the others did, sit back, watch, and put in his two cents when it would make the most sense. I really liked seeing that part of him. Cherry: I’ve seen him speaking up more often in interviews recently. I wonder if he’s always been like that in private and is just getting more comfortable with it publicly. Stephanie: They did talk about how they would be showing the sides to themselves that they generally actively try not to show. It’s funny how this was a plus for them. Cherry: I’ll be interested to see if they can do it. That seems like it’d be really hard to turn on and off. Moving on to the episode overall, this was very much an introductory episode. I can see why they made this one free, to pull in the viewers for the rest. I especially liked the solo interviews. Stephanie: I loved that moment when they were eating and then they realized the camera was on and instantly began cleaning up after themselves. It makes them seem more real. For better or worse, I hope we do get to really see behind the scenes. And, yeah, I can see this was like a taste-test. It reminds me of some of their other variety shows where they have a kick off meeting. Cherry: Heh, I liked that they were questioning Jungkook on why he wanted to clean up, when he never does when the camera’s off. That’s right, guys, call him out! Stephanie: I like the idea of being able to see them as real guys as they are men in their early(ish) twenties. Although, we may see the ‘real’ them, I highly doubt we’re going to see the real them. Though this seems very pointed towards their American takeover, fans all around the world will see this and we know how netizens can be. Maybe it will be some cross between the two. Stephanie: You have a Yoongi bias??? Stephanie: As I legit am looking at two separate Yoongi pictures you have as your icons? Laugh. Now, I’ve been teetering between Hoseok and RM, but let me tell you, looking at RM be all leadery? Hella hot. When he shouts at some point warning everyone not to hurt themselves? You can totally see why he’s the leader of the group. It’s nice to see. And by nice, I for sure mean SQUEEEEEE! Cherry: I’ll have you know, those aren’t two separate photos, one is just a zoomed out and the other zoomed in! I had fun watching them practice and figure out who’s doing what in those sections that seemed looser when I actually saw them in concert. I’ve been to enough concerts that I know those aren’t spontaneous, but I’ve always wondered how they come up with them, and seeing them being put together on the back end was fun. Stephanie: HAHAHHAHA. Point taken. I really did love seeing them work on the concert, heckling each other, working out the set lists, seeing the little funny errors and them truly just having fun and working hard. The moments you see with them off to the sides not on the screen. I really feel like they like each other and we’re going to see that here. Cherry: Same. I’ve seen them talk about how they’re family, after spending so many years together, and we all know family may love each other, but sometimes you can’t stand each other, either. 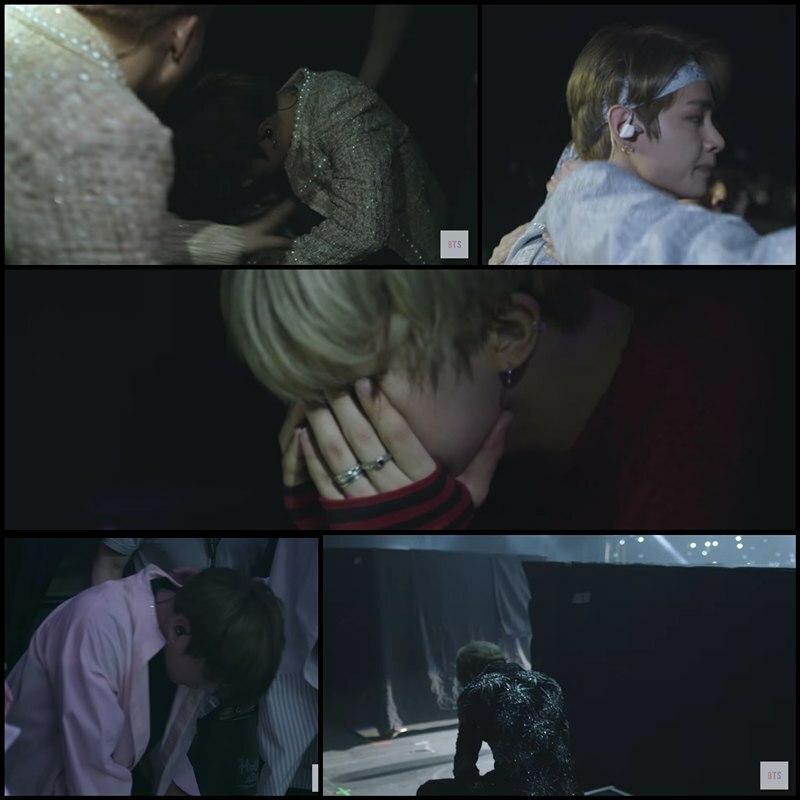 As RM said in the beginning, they fight and argue sometimes, but you can see that in the end, they’re brothers. Stephanie: Let’s all just stop right here for a collective awwwww…..
Cherry: Right? I loved when Jimin was talking about how he keeps going because he loves working with them. Stephanie: Yay! How did you feel about their messages to future selves? Cherry: Very interesting. I’m not sure we got a straight answer from some of them, but I’d be interested to see them react to them at the end, after they’ve gotten more comfortable opening up. Jin and V were the two I noticed most in that vein. I loved how thoughtful and personal Namjoon’s was. Jimin’s just made me want to hug him. Stephanie: I’m wondering if we’re ever going to see behind Jin’s “handsome” schtick. I’d like to get to know the real him. Cherry: I feel like we see little glimpses now and then. Maybe we see a little more of the real him when he’s eating? 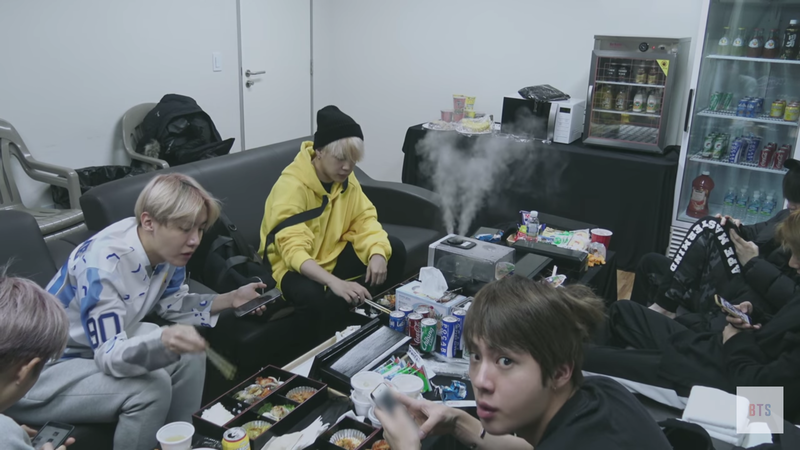 I do love to watch an “Eat Jin” episode and see him get lost in his food. Stephanie: I can tell they are leading into angsty bits in the next episode. But this one was a light intro. Breezy and fun. I look forward to more meat. Let’s try this. Was there something that surprised you? Or that struck you? For me? 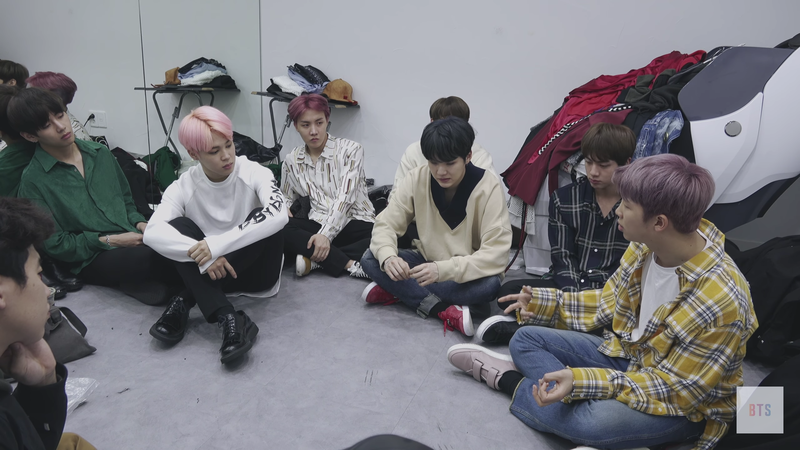 (Bypassing the hints of their hardships in the next episode) It’s the bit when they were showing flashes of future concerts, when they were between songs and people were frantically blow-drying their hair because they got so sweaty. Dude! I never even thought about that! Now that’s what I’m going to be thinking about between songs at Kpop concerts. Heh. They’re back there getting their hair blow dried. Cherry: See? I barely noticed that. I think mine is what I talked about earlier with planning the “spontaneous” portions of the show. I’ve wondered about that for years, since I was in my early 20s and ended up at two concerts from the same tour within about a month of each other. The patter between songs seemed really off-the-cuff and fun the first time around, and at the second concert, here they were with exactly the same patter and it sounded just as off-the-cuff. 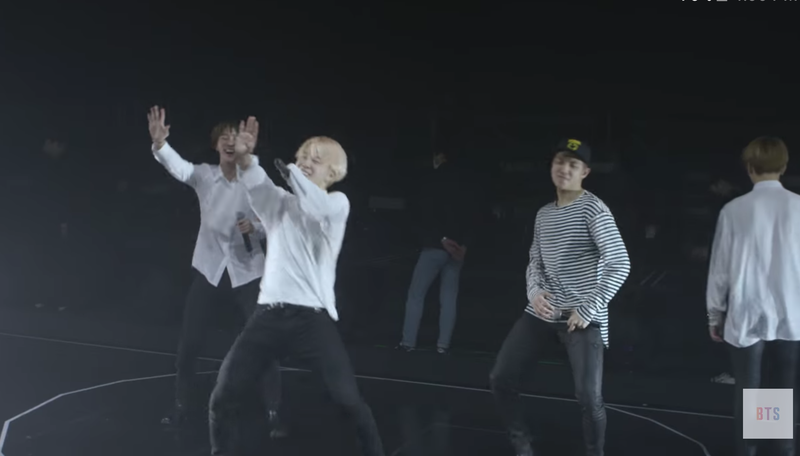 And it was fun to see BTS doing their behind-the-scenes planned for it in a concert I’ve actually been to. It added an extra dimension to my experience. Stephanie: It was really cool/surreal seeing the behind the scenes of actual concerts we’ve been to. I was like–I saw him in that jacket! Oh, that’s what that looked like up close? I can not wait to watch the rest of this series! It kind of bums me out that it’s once a week, I want it to be done and out so I can binge it in one sitting, feel bad I binged it in one sitting, then sit there and watch it all over again…. Now I might have revealed my bias…my all of BTS bias that is! Cherry: And, with that, we move on to episode 2, which is already out — but does that mean there won’t be one next week or will they air episode 3? We don’t know! The finding out will be an adventure for us all! (Which mostly means, if they put out episode 3, we might watch the next two closer together, so we’re not behind and in danger of spoilers.) Stay tuned for more info. Thank you so much for your recap chat thingy.